"This is a party favorite. Everyone fights over the pan as soon as it comes out of the oven! Serve it with wheat crackers or small pieces of rye bread." Spread sauerkraut into a 9x13-inch baking dish. 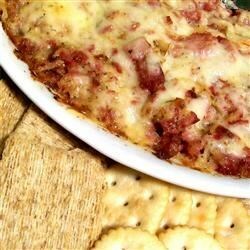 Layer corned beef, Swiss cheese, and the mayonnaise-dressing mixture on top of the sauerkraut. I have used this recipe before and I put all the ingredients together and then let cook in my crock pot for 4 hours. Then I serve it in my mini crock pot in order to keep it warm. I used 8oz cream cheese instead of mayo. I made in a crockpot on low and served with party rye bread and triscuits. It was a HUGE hit at work and at a school function!